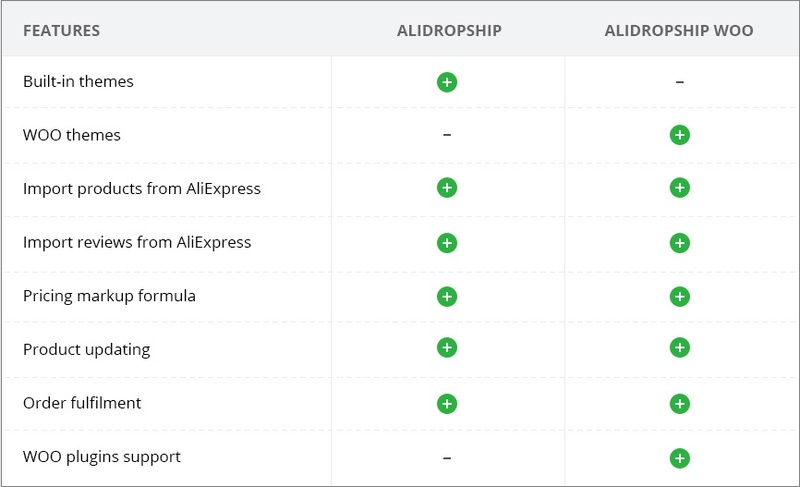 AliDropship plugin comes in two versions: AliDropship original plugin and AliDropship Woo Plugin. Depending on your personal preferences, skills and business aims, you may choose either version of the plugin. Refer to the comparison chart below to learn the major differences between the two plugins. You already have a WooCommerce-based online store, and you need to fill it with AliExpress products in a quick, efficient, and effortless way. You are looking for a full-scale solution that contains all the necessary features in a single package and doesn’t require you to search, install and pay for any additional plugins and themes. Please note that AliDropship original plugin is compatible with only the built-in themes and does not support Woo themes. On the opposite, AliDropship Woo plugin works with themes produced by WooCommerce and cannot be installed with the built-in themes. Since AliDropship original plugin is not compatible with WooCommerce and AliDropship Woo plugin, you should carefully consider all options of the two plugins before making your final decision which version to go with. If you decide to switch to the other version of the plugin, you will need to reinstall your WP and start your website from scratch. This must be done to avoid possible conflits between the plugins.